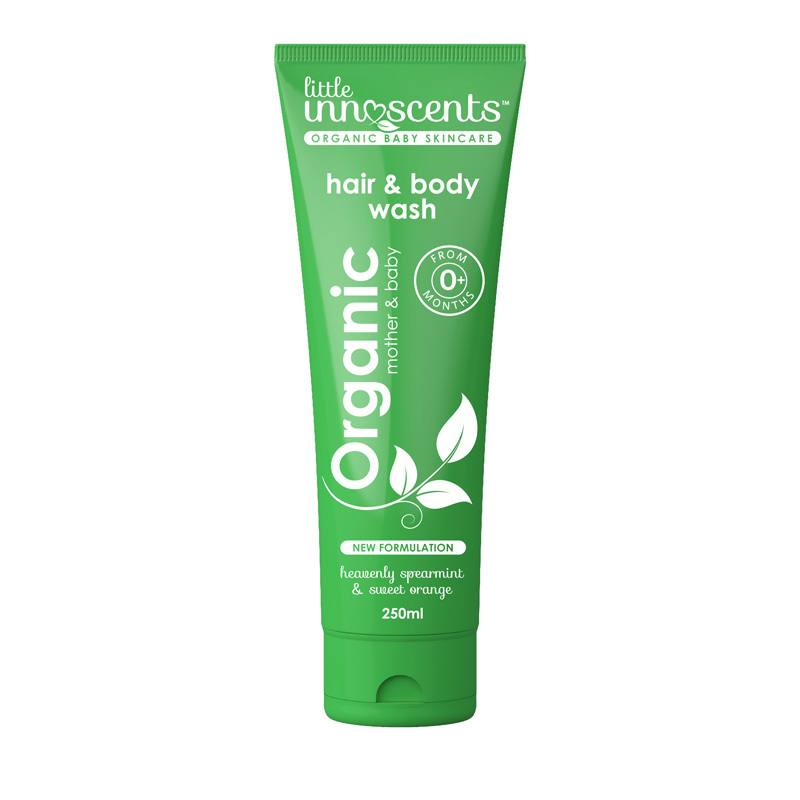 Little Innoscents’ top selling organic skincare product is our deeply cleansing and refreshing Hair & Body Wash.
A favourite with the entire family, this all-in-one hair & body wash is bursting with heavenly essential oils of Spearmint, Lavender and Sweet Orange. You will instantly fall in love with its fresh scent and invigorating qualities. “We have recently given the Hair & Body Wash an overhaul, added in a few new organic ingredients and now made it even more delightful than ever. 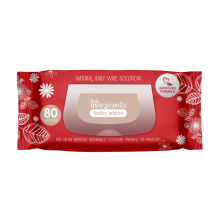 With over 85% Australian Certified Organic ingredients, this delightful gel is gentle enough to use daily while still effectively removing dirt and grime, whilst now offering natural bubbles that the kids will love. “It is so important for both children and adults to be bathing and treating their skin with organic and natural products. “Before you make a purchase look for the ‘certified organic’ logo to ensure the health of your family”. 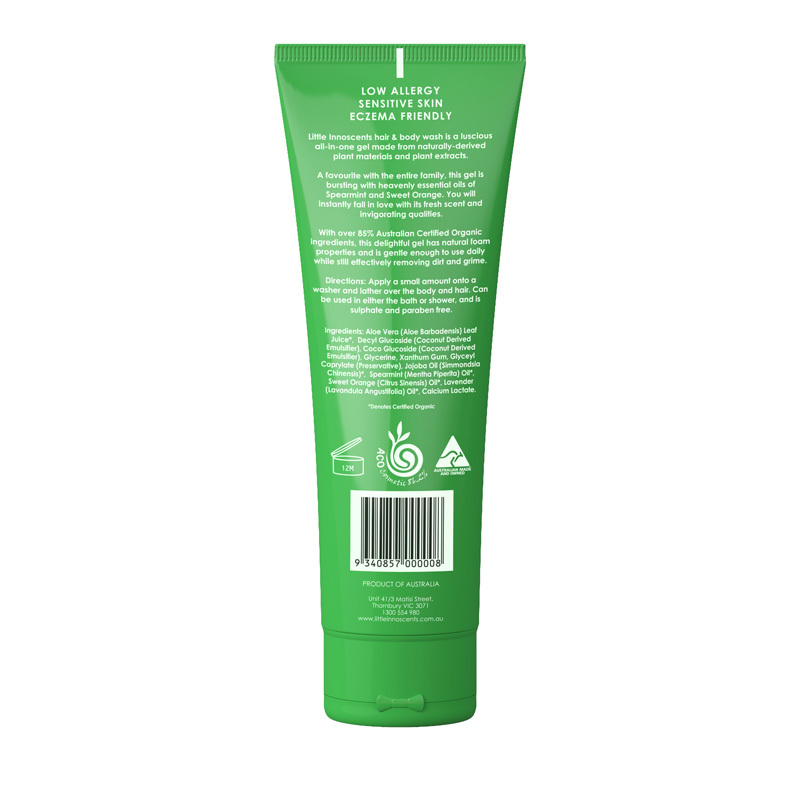 The Little Innoscents Hair & Body Wash can be used liberally either in the bath or the shower, and is naturally low suds and sulphate free. Its pH balanced formula and nourishing organic ingredients make it ideal for use on sensitive skin, and works to help effectively sooth dry itchy skin conditions. in the knowledge that their child’s skin will be cleansed, nourished and protected. 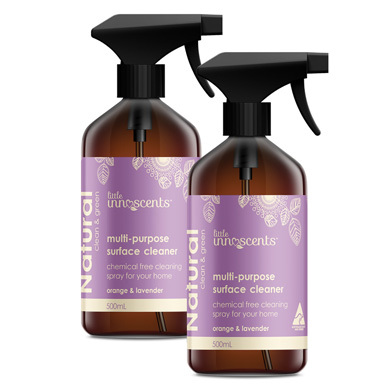 Little Innoscents products are Australian made with 100% Natural, Pure and Organic ingredients. 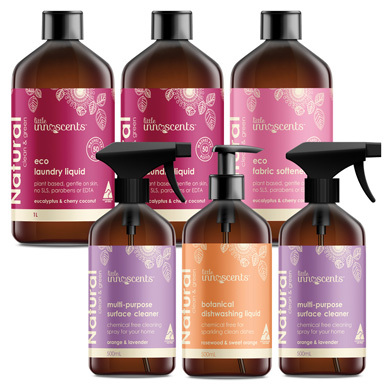 Completely free from Toxic Chemicals, Parabens and all other little hidden nasties. Caution: Avoid contact with eyes and rinse out with water if stinging occurs. Aloe Vera (Aloe Barbadensis Leaf Juice)*, Emulsifying Wax (Decyl Glucoside & Coco Glucoside), Vegetable Glycerine, Xanthum Gum, Preservative (Glyceryl Caprylate), Jojoba Oil (Simmondsia Chinensis)*, Aqua (and) Lactic Acid. , Spearmint (Mentha Viridis Oil), Sweet Orange (Citrus Aurantium Dulcis oil)*, Lavender (Lavandula Angustifolia Oil). Thank you little innoscents for providing us with a beautiful organic baby skincare alternative that we love for our midwifery group practice mums and bubs. They are always well received and smell absolutely amazing. It is great to be able to provide a safe product for babies sensitive skin! I have tried many natural baby products over the years.. I finally found the little innoscents range, I love the ingredients and the smell is divine. I not only use it on my 3 babies but myself also. Beautiful body and hair wash with perfect results and ingredients. If you want something that can replace both your hair wash and shower gel, and something 100% toxic-and-chemical-free and something super fresh and relaxing scent, this is the one to go for. I have been loyal to this hair and body wash for years and still planning to stay. This hair and body wash is perfect for my little ones! I’m always looking for good organic products and love the simplicity of shampoo and wash in one product.And here this one ! Perfect for working mums and big family. Join the Little Innoscents family for news and special offers!